Our versatile SureSource power plants are capable of producing multiple value streams, including the on-site production of high purity hydrogen along with ultra-clean electricity and usable heat. In a standard configuration, a fuel, such as clean natural gas or renewable biogas, is reformed inside the fuel cell into hydrogen, which then electrochemically reacts with air to generate power and heat. Our SureSource Hydrogen fuel cell power plant is configured to produce additional hydrogen beyond what is needed for power production, generating a stream of hydrogen suitable for industrial or transportation applications. This configuration utilizes the commercial SureSource product line, transforming the distributed power generation system into one, which is also a low-cost and efficient distributed hydrogen production system. 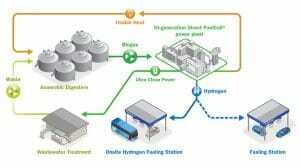 Read more on this solution in this White Paper on Distributed Hydrogen. This application helps to address the need for a hydrogen fueling infrastructure by cleanly and affordably generating high-purity hydrogen in urban locations. An ideal application is installing a SureSource Hydrogen at wastewater treatment facilities to utilize renewable biogas as the fuel source and generate power and heat for the water treatment process and renewable hydrogen for transportation. Price points are competitive with existing hydrogen generation technologies while the environmental profile is much more attractive. For example, the SureSource Hydrogen is eligible for the State of California Low Carbon Fuel Standard and is considered carbon-negative by the California Air Resources Board (CARB) due to the avoided emissions by a fuel cell electric vehicle powered by renewable hydrogen compared to a gasoline-powered vehicle. This renewable vehicle fueling solution was demonstrated for three years at the Orange County Wastewater Treatment Plant in Fountain Valley, California. This project involved converting renewable biogas from the wastewater treatment process into ultra-clean power for the wastewater treatment facility and renewable hydrogen, which was supplied to a hydrogen vehicle fueling station. 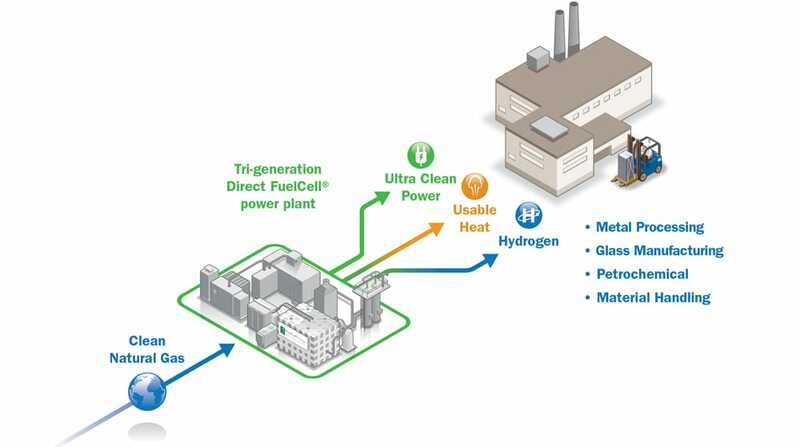 Industrial applications, such as metal heat treating, glass manufacturing, petrochemical applications and material handling is another application for clean and affordable distributed hydrogen generation. FuelCell Energy is demonstrating this application at the Company’s North American manufacturing facility. The ultra-clean electricity powers the manufacturing process, the heat is used for facility and water heating, and the high-purity hydrogen is used in the process ovens, replacing purchased hydrogen that was trucked to the facility. Hydrogen production for either transportation or industrial applications via our SureSource Hydrogen generates cost savings while enhancing the reliability of supply gained from on-site generation of these multiple value streams, and deliveres in a manner that promotes sustainability initiatives.